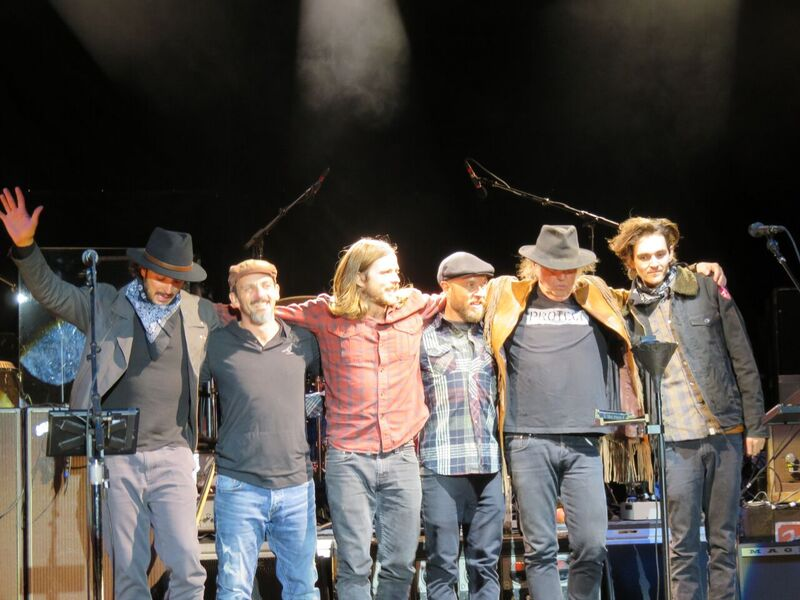 The Concert Review of the Moment is of Neil Young + Promise Of The Real in Boise, Idaho on October 3, 2016 by our dear friend Alan in Seattle. 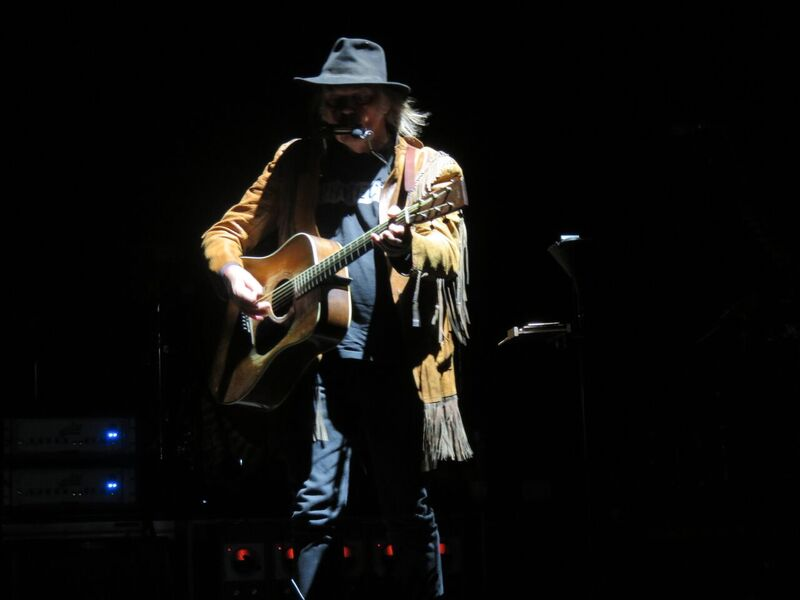 So, my wife got me a ticket to the Neil Young & Promise of the Real show in Boise because she knows how much of a fan of the man I am. I saw the same band play in Seattle 365 days prior to the Boise show and they played terrifically well. I had to see them again. I drove 1100 miles round trip in my Prius gas sipper with lots of good music. I listened to lots of great music on the way but only 1 Neil Young song: "Are There Any More Real Cowboys" which I had on a Willie compilation I made for the trip. I mostly avoided listening to Neil Young for over 2 months before the show. I rolled up to the venue parking lot at 3pm and I thought I could hear the band playing "Here We Are in the Years" in the distance. I grabbed my bag and headed for the band. I passed the old penitentiary walls and literally walked right into the venue without showing my ticket. Security was not present as far as I could tell and I saw my path in and made for the stage out in the wide open grass lawn at Outlaw Field. 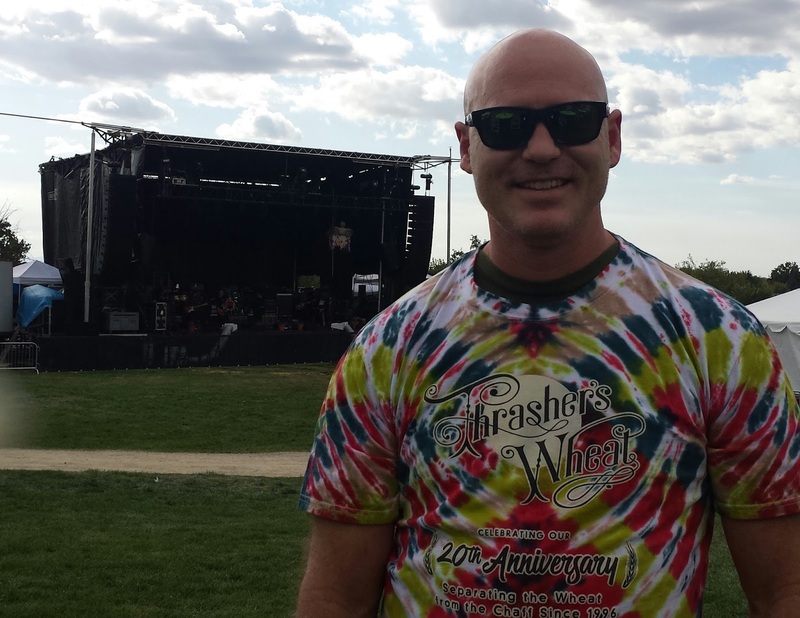 I walked up 100' from the stage, a lone fan and his favorite band, in this charming venue. Cops were walking around as security but everyone assumed I had some right to be there, which of course, I did! Last they played "Surfer Joe and Moe the Sleaze" from Reactor! I shot poor video with my phone in the grass just to catch part of the song. 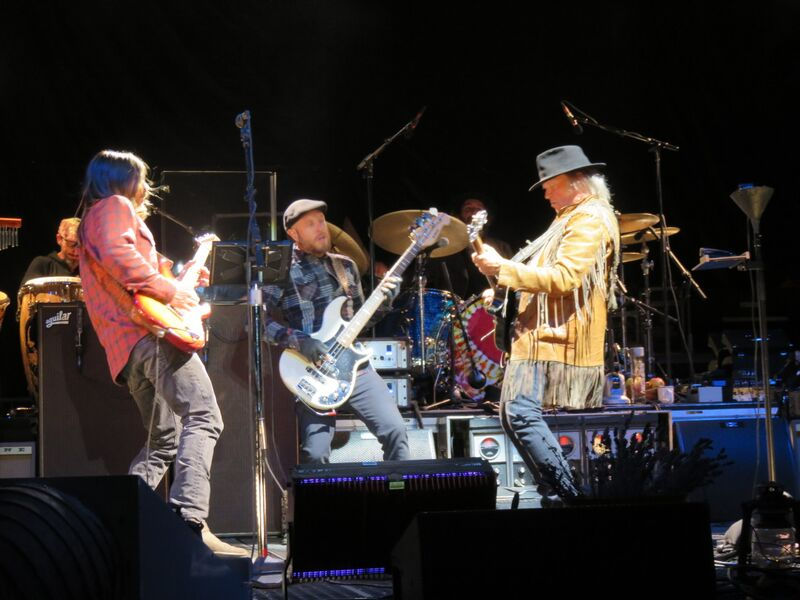 It sounded great and I was so thrilled to see this rare song live, a single solitary Neil Young fan watching his idol toss out an irreverent number! That song would not be played again that day, unlike the 4 new songs. The new material all has a Pro Native, Protect the Water, Stand with Standing Rock kind of feel to it, which I love and believe in. The new material is strong. It sounds better than the Monsanto Years stuff did at first listen. They grew into that material. This sounds more vital. The band version of "Indian Givers" sounds far stronger and better than the video Neil made of the recording.They left the stage and I still had a few hours before the gates would open at 6pm. By then security had figured out how to close a gate. I eventually returned to my car to regroup and get rid of my backpack and bring in only a water bottle and a hat. The gate was in chaos before the show with the security looking like dopes while the crowd waited past the 6pm "open gate" hour, and on we waited. Eventually we were screaming at the guards, "Let us IN!" Finally, they swung open the gate and didn't ask anyone for their tickets! These guys were amateurs, but, its all good with me after the incredible time I spent watching the band rehearse and play prior to the main event. I nabbed a spot on the front rail, center. 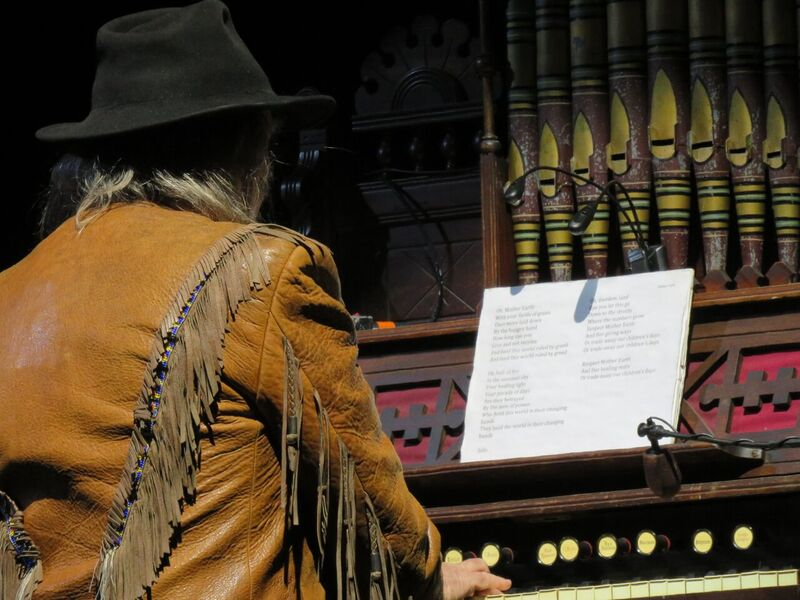 The show began again with Neil solo on the pump organ for AtGR. He did a heartfelt set of his acoustic guitar numbers, 1 from each major album up to Harvest Moon, which saw more play later. The band was great when they joined him and he played the White Falcon for the opening electric numbers. "Words" was fantastic. All of the songs were tremendous. The band played on, building in passion and power. 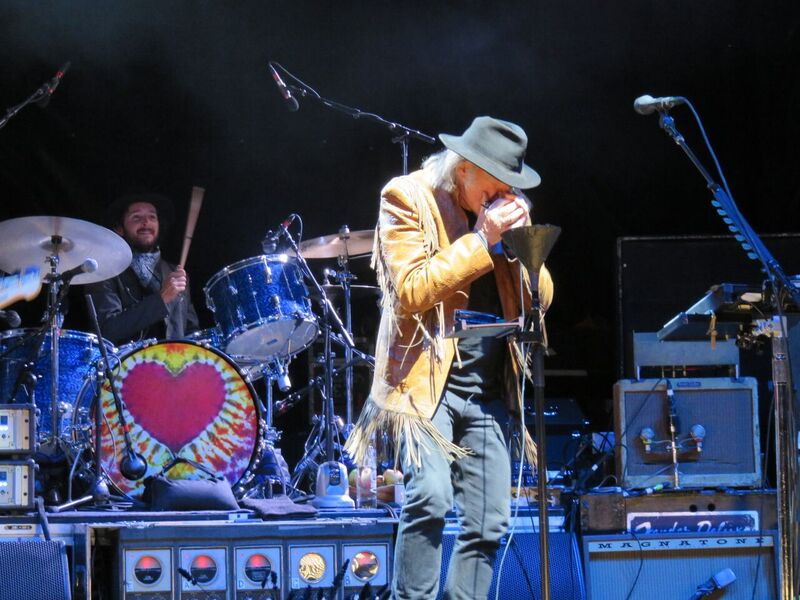 Neil Young stood for some new tracks playing harmonica into a distorted amp and absolutely played the most searing harp the world has ever witnessed. The best harmonica players would've tipped their hats to Neil that night. Between his effects, technique, and dramatic stance, he became the coolest Blues Grunge harmonica player at once in a category previously unheard of. Neil defies labels and pushes the boundaries of what Rock and Roll can do. He looked like Zeus in a mob hat with his leather fringes. At various times during the show, the Godfather of Grunge played Old Black, his eyes pierced ferociously below the rim of his cool hat, at the doubter or some corporate behemoth? His raging power wielded thunderbolts. The heavens literally ripped open in a reign of ragged glory. Powderfiinger was so powerful I had tears streaming down my cheeks, to feel the pain and lost love, and lost life in that song, and here I was, in such good fortune, with a great wife and kids and career I am so fortunate to be a part of. I have always had a special appreciation for Powderfinger and this time the waterworks came on. Was it all the driving? Or was it that my hero came to play in Boise and somehow I got to go there for the show? Seed justice was excellent. Cowgirl in the Sand was phenomenal and the fiery interplay between Neil and Lukas was molten hot, speaking in the realm of the guitar strings. Vampire Blues was a rare treat. Hey Hey, My My was on the edge of reason in its crunchy powerful delivery. I was blown away. It reminds me of the Ragged Glory tour but was… even more powerful?! One of the few times I have listened to Neil Young music in the last few months was when I checked out the great video for the new version of RitFW with the false endings and the reprised passages, in time. How do you make that song better than it was before? Somehow Neil has found a way! Mansion on the Hill was smoking hot. Winterlong was very nice and pretty. Indian Givers was a strong encore. Love and Only Love was infused with psychedelic grunginess very well and was the final encore of the night. Neil lets Lukas Nelson play extra lead parts over the "top of the riff" and Neil encourages him and smiles. Micah resembles a mad scientist off to the right as he adds depth and beauty to the songs. His playing reminds me of Ben Keith in the part that he plays. The bass player is phenomenal, bouncing around, catching air. He loves his job and we love him in it. The drummer is on the beat, having fun, with the luckiest bongo player in the world doing what he does best. They have grown as a band and they have a certain powerful, gorgeous sound. It punches, it crunches. They are making great music. I'd say they are well ready for "Desert Trip" -the most expensive music festival ever featuring the fewest / biggest bands / artists ever down in the California Desert. I happily attended this smaller event and was over the moon with the results! 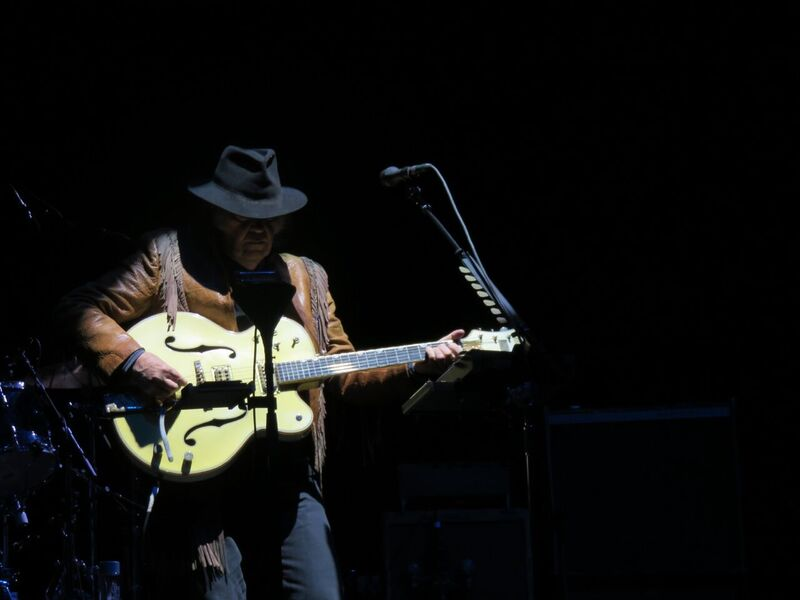 I have seen maybe 250 or 300 shows and Neil Young consistently delivers the best of them all. My 17th time seeing Neil Young, or is it 18 now? This is not the first time I have gotten lucky at a Neil Young show. The first time I saw Neil Young and Crazy Horse play at the legendary Old Princeton Landing, I snuck in with a buddy after we made bad counterfeit wristbands! I saw 6 of those shows by the time they were done. Lots of material from Zuma and American Stars and Bars. The stage was 6 inches high. I stood 4-5' from Neil during 2 of those shows. The Boise show 20 years later was comparable. 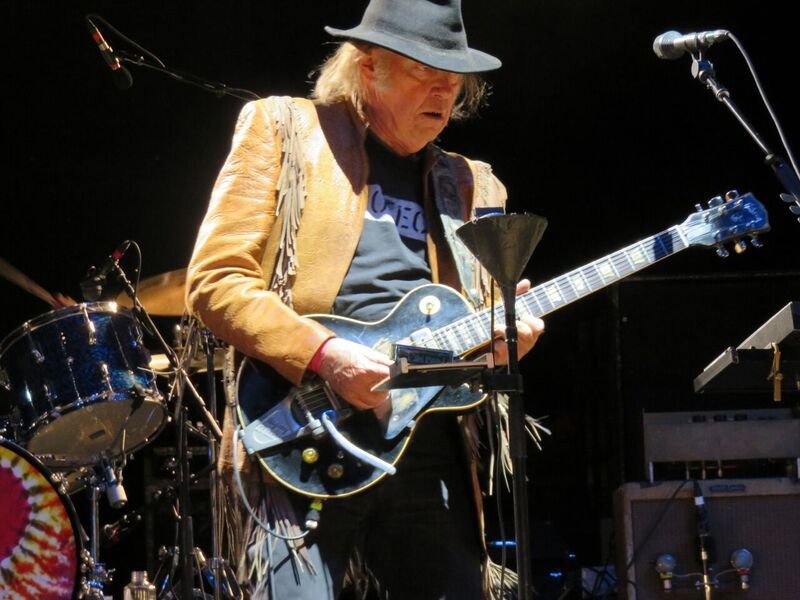 Long live Neil young and Promise of the Real. I had a feeling they would be recording together again and would continue playing together. ps - Thrasher, I wrote it up review once on my phone and then lost the whole thing before posting. It would've been too long to post on the comments page anyway, I later learned. It was an epic road trip. I was a bit wiped out after returning. Doing that kind of road trip at age 47 is a little different than it was at 20, but my immaturity carries me through. The show was absolute bliss. His power at this age is unbelievable. I really think Neil has found his "2nd wind" with this band after so many of his buddies have died. This is the encore after Ben Keith, or so I imagine. I am hungry for more. His prolific work and inspiring product continue to amaze me. Are you headed to any more shows during this warmup tour? Farm Aid would be so cool. I missed Neil a few times when he was at my doorstep, like the LWW tour. Ugh. I'm kind of funny about CSNY… in that I think the best thing they every did was get Neil to play with them. To me, he has more talent in his little pinky than the entire rest of the band. But, I haven't ever really succeeded in fully appreciating their work. Not enough meat on the bones. But, as a dear departed friend used to say, there's no accounting for taste! Alan - Very awesome Concert Review of the Moment! Thanks so much for sending along and cool that you got a super Neil + REAL concert. You're right on about Neil finding his "2nd wind" with POTR. I think it has also to do with all of those Willie "genes" up onstage with him. As for more shows for us? We wish we could. We really want to be at Bridge again this year. Not sure after doing the Telluride concerts. But never say never. Thanks so much Thrasher. Sorry for the typos in my story. And my dad was a English professor. Yikes. Its the Road Eyes, y'see? Yes, Bridge is great too. I was there in 96. I wouldn't rob a bank to see them but its a close call. Wow! Thanks for the review. I'm an Idaho native (currently in Indiana) & would have loved to have been there. Neil is a legend. When Harvest Moon came out I played that CD EVERY MORNING for at least 2 years - as soon as I got up. ;-) Also, very cool that you saw the rehearsal. Keep on rockin' in the free world!